To bring Central Illinois men together in harmony and fellowship to enrich lives through singing. Each Tuesday, 7-9:30 p.m., Second Presbyterian Church (Grace Hall) in Bloomington, IL. Our director since 2002 is Terry Ludwig. A barbershopper since 1987, Terry has a background in music education and performance. 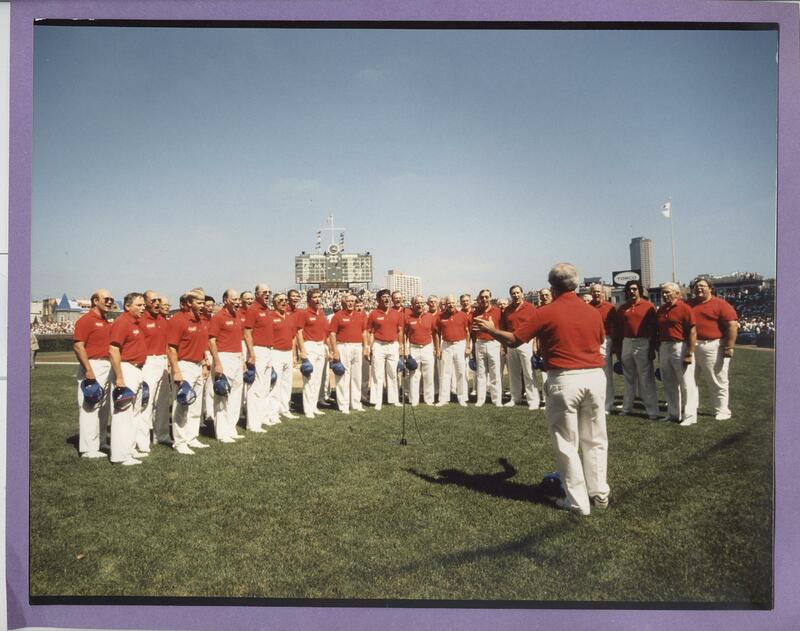 He came to the Sound of Illinois from the Quincy Chorus, which he directed 13 years. 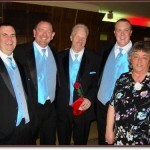 Terry has also sung in quartets, including the 2011 Illinois District champion Waldorf Hair Company, and he is a coach. Assistant Director is Tim Beutel, tenor of the 2010 Illinois District champion After Hours. Tim is a middle school vocal music teacher in Morton, Ill. Byron Blair, a barbershopper since 1975, is vice president-music and associate director. A former Tri-Valley music instructor and pit pianist for Conklin Dinner Theater in Goodfield, Byron is a former director and baritone section leader of SOI. He sings baritone in a chapter quartet, Harmony Guaranteed. Our chapter is managed by a board of directors and led by a slate of officers. They meet monthly. The Bloomington Chapter #1 is a 501(c)(3) non-for-profit organization in Illinois. Our operations are funded by income from our annual shows (including advertising fees in our printed program) and Singing Valentines, plus other paid performances. We receive grants from the Town of Normal’s Harmon Arts Council and State Farm Companies Foundation. Income covers expenses that include rental fees, music, risers, director, uniforms, and show expenses. The Bloomington Chapter held its first meeting April 27, 1942, at the American Legion Building. Soon after, the chorus met at the Illinois Hotel (the building still stands in the 200 block of West Jefferson). The first meeting was at the invitation of B. Paul Jefferson and L. Earl Bach. Paul became first president, John Hanson of Peoria was hired as director on May 18, and the Illinois Hotel became the rehearsal site that year. Other founding members (in addition to Jefferson and Bach): K.R. Ward, secretary-treasurer; Joe Bunting; Otto G. Beich; L. Earl Bach; Dave Ward; Hugh A. Henry; Floyd Dana; Art Kane; Dan Carmody. The Sound of Illinois organizes and finances a day-long festival each fall that provides free vocal education and training for Central Illinois high school music educators and their students. 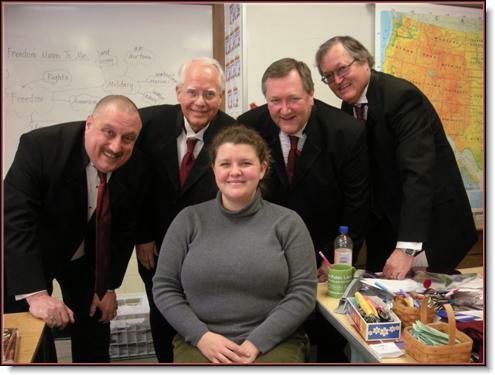 Held in Bloomington-Normal, the workshop also receives support from the Illinois District of BHS and Region 5 of Sweet Adelines International. Highly-acclaimed a cappella clinicians conduct the full day of rehearsals and the evening concert. 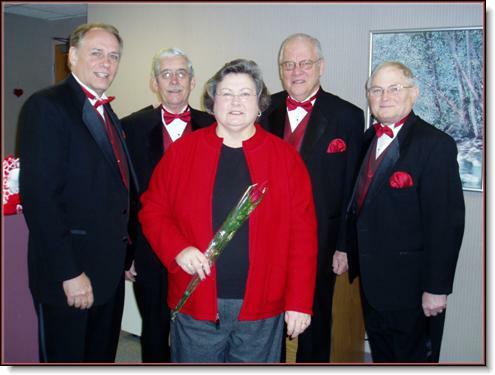 On Oct. 29, 2009, the clinicians were Gene Cokeroft of Miami, tenor of the 1961 international champion quartet The Suntones and Orange Bowl festival organizer for more than 20 years, and Vocal Spectrum, a St. Louis quartet which won the Barbershop Harmony Society’s 2006 competition. About 450 students from 15 area high schools came to the Bloomington Center for the Performing Arts. Cities included: Argenta, Bloomington-Normal, Champaign-Urbana, Dunlap, El Paso, Eureka, Fairbury, Heyworth, LeRoy, Mt. Zion, Pekin, Springfield and Urbana. Contact: Rich Hansen (hansenr@mtzion.k12.il.us) or Greg Grey (bshopgreg@aol.com). The Bloomington Chapter has brought barber shop harmony to audiences in Central Illinois since its founding in 1942. Early shows featured quartets from the Midwest, plus some songs from the Corn Belt Chorus. This mass chorus included singers from Bloomington, Peoria, Decatur, Champaign-Urbana, Springfield and other smaller communities that had choruses. At that time, they were all directed by Bloomington’s first director, John Hanson. He taught all groups the same music and called them all together when a large group was needed. From the beginning, the Bloomington chapter was large enough to perform alone. Joe Bunting’s The Birth of SPEBSQSA in Bloomington lists the number of founders at 55. Joe was managing editor of The Daily Pantagraph and served as show emcee six times. Other show emcees of note: L. Earl Bach, a founding member and established local attorney; Bob Lindley, then head of McLean County Association of Commerce; Don Munson, then morning show host on WJBC Radio; Rich Buchanan and Richard Godfrey, mayors of Bloomington and Normal, respectively; Judy Markowitz, mayor of Bloomington; Sandi Hawthorne, local realtor and performer. The annual shows are held the last weekend of February each year and always feature at least one guest quartet. Many international champion quartets have appeared on the SOI stage, which has always been the Bloomington Center for the Performing Arts (and its predecessor, The Consistory), except for a period in the 1970s at Illinois State University’s Braden Auditorium. International champion quartets that have appeared in Bloomington shows: The Elastic Four; The Misfits; The Buffalo Bills (of The Music Man fame), 5 times; the Mid-States Four; The Confederates; The Four Renegades; Auto Towners; Dealer’s Choice; The Ritz; Second Edition; Gas House Gang; SunTones; Roaring 20s; Boston Common; Gentlemen’s Agreement; The Four Hearsemen; Interstate Rivals; Chicago News; Classic Collection; the OK 4; Four Teens; Vikings; Schmitt Brothers; Four Renegades; Happiness Emporium; Bluegrass Student Union; Vocal Spectrum; Gotcha! ; Power Play. 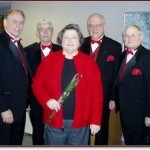 Each February, quartets from the Sound of Illinois Chorus perform Singing Valentines for local patrons. This event covers several days around Feb. 14 and is major fund-raiser for the chapter. The SOI is a regular performer in Bloomington’s Concert Under the Stars series at Miller Park; the Sounds of Christmas program in December, organized by The Music Shoppe of Normal, promoted by WJBC Radio, and hosted by State Farm Insurance Companies. 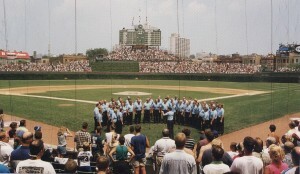 On two occasions, SOI has performed the National Anthem at Wrigley Field preceding Cubs baseball games. Most recent appearance was July 13, 1997. A chapter quartet also performed the 7th inning stretch the first year after Harry Caray’s death, leading the crowd in Take Me Out To The Ball Game. 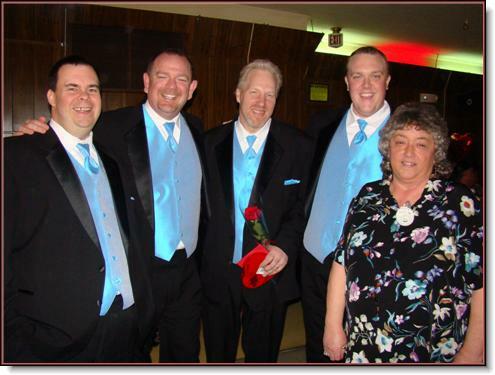 Whether you need a full chorus or a quartet, the Sound of Illinois can be hired to provide the ideal solution to your entertainment needs. Let us know of your needs, and we’ll find a solution. We sing for private parties, fund-raising events, conventions, concerts, dinners, sporting events, business promotions, and other special occasions. You can count on wholesome entertainment ranging from 15 minutes to more than an hour. Contact: Jim Waldorf: jwald1603@aol.com or 309-663-4880. The SOI also performs as a community service at nursing homes, hospitals and churches during the year. The Barbershop Harmony Society is governed by an elected board of directors and is administered by a 30-person professional staff at Harmony Hall in Nashville, TN. 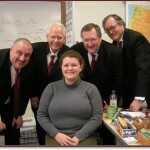 Until 2006, the organization was known as The Society for the Preservation and Encouragement of Barber Shop Quartet Singing in America, Inc.
Our Worldwide Activity: We have affiliated barbershop organizations in Finland, Australia, New Zealand, Germany, Ireland, South Africa, Sweden, The Netherlands, and Great Britain. There are also barbershop singers in Denmark, Israel, Japan, Saudi Arabia, and parts of the former Soviet Union. Our Founding: First meeting was April 11, 1938, at the Roof Garden of the Tulsa Club in Tulsa, Okla. The Illinois District is one of 16 regions in the Society and is comprised of 36 chapters and 1,200 members. Illinois has more than 70 registered quartets. The district has a proud history in competition. Illinois winners of gold medals in international competition include 10 quartets, 4 senior quartets and 3 choruses. The style. 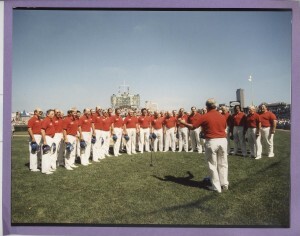 Barbershop music is four-part, unaccompanied, close-harmony singing, with melody in the second voice, called the “lead.” Tenor (counter-tenor voice) harmonizes above the lead singer; bass sings the lowest harmonizing notes, and the baritone provides in-between notes, to form consonant, pleasing chords. Barbershop is a “melting pot” product of African-American musical devices, European hymn-singing culture, and an American tradition of recreational music. Melodies are in the vocal and skill range of the average singer, with lyrical emphasis on simple, heartfelt emotions. The legend. The description of the style as barber shop music derives from the legend of early rural barber shops, where men gathered on Saturday nights for haircuts and conversation while their wives shopped for the family. To help pass the time, the barber is reputed to have encouraged improvisational harmonizing as he sang out a medody while he was cutting hair. And that’s where the barber shop label began.